Denny Hamlin piloted the No. 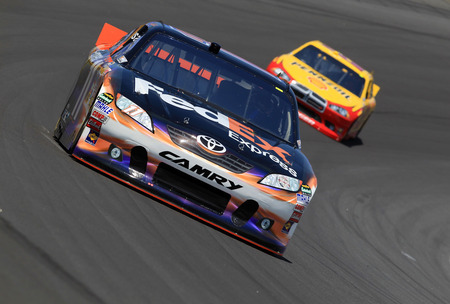 11 FedEx Freight Toyota to a 16th place finish in the Hollywood Casino 400 at Kansas Speedway last Sunday. With the result, Hamlin remains 12th in the Chase for the NASCAR Sprint Cup Series standings with six races remaining. The FedEx team started the day on the inside of row four after posting a strong qualifying run on Friday. Handling issues began to plague the car almost immediately after the start. Hamlin reported a lack of grip in the corners and worked with crew chief Mike Ford to try to bring the car to life. The second pit stop of the day came under green flag racing on lap 66, bringing a welcome opportunity for a wedge adjustment to help correct the handling problems. Despite the loose race car, the team was still running just outside of the top 10. A green flag pit stop on lap 172 finally paid off for the team, with another wedge adjustment that seemed to improve the car’s handling with Hamlin in 12th place. A string of caution flags closing in on the end of the race tested the strategy of the crew chiefs. Under caution on lap 220, the FedEx car came to the pits for a wedge adjustment, right side tires and enough fuel to take them to the end. During another caution flag on lap 240, Ford kept the FedEx car on the track, moving Hamlin up to second place. However, handling issues and older tires kept Hamlin from maintaining pace, and he dropped to 16th for the checkered flag behind winner Jimmie Johnson. Hamlin is making his 13th career Cup Series start at Charlotte Motor Speedway on Saturday night, Round 5 of the 2011 Chase. The 30-year-old Virginia native has five top-10 finishes in 12 career races at the 1.5-mile oval, including a career-best fourth-place finish in the Bank of America 500 one year ago. Earlier this year, Hamlin started fourth, led 24 laps and finished 10th in the Coca-Cola 600 at Charlotte. With differing fuel strategies among teams, Hamlin tried to conserve enough gas to make it to the finish after his final pit stop, but a caution with four laps remaining set up a ‘green-white-checkered’ restart with Hamlin in third. Leader Kasey Kahne ran out of fuel at the green flag, and Hamlin moved into second behind Dale Earnhardt Jr. However, both drivers ran out of gas on the backstretch of the final lap, and the #11 Toyota coasted to the checkered flag in 10th. In total, Hamlin has led at least one lap in eight of 12 races at Charlotte. The FedEx Express operations team in West Columbia, South Carolina will be recognized with its “USCA” code letters on the b-post of the #11 FedEx Express Toyota this weekend. Does your position in the points allow your team to go for more race wins?